Despite blowing an 11 run lead, Hawks manager Julian Adams praised his defending champions Hawks team, after they fended off That’s Ya Problem, 19-16, to avoid being swept in the Virgin Islands Baseball Softball Association Harriette Skelton League Championships Series on Sunday night at the E. Walwyn Brewley Softball Park. That’s Ya Problem defeated the Hawks, 20-7 on Friday, after opening the series with a 20-19 thriller. A Miranda Marie first inning homer got the Hawks rolling as they jumped out to a 4-0. They added seven run on four hits and capitalized on five TYP errors to go up 11-0 in the second. After the Hawks added two in the top of the third, TYP finally got on the board with four runs cutting the deficit to 13-4. TYP held the Hawks scoreless in the fourth for the first time in the game and pulled within 13-6. TYP kept pecking away at the lead to pull within 14-10 by the end of the fifth inning. 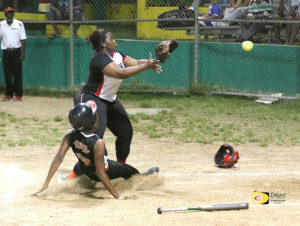 Winning pitcher Tredecia Hart, helped her cause by legging out a double to center and third baseman Laura Issac tripled in giving the Hawks some cushion at 19-14, before getting two quick outs, allowing two runs before picking up the 19-16 victory. TYP now leads the series which continues at 7 p.m. on Friday, 2-1. Hart as 3 for 5 with two runs scored and 3 RBIs. Marie finished 2 for 5 with two runs batted in and Michelle Georges was also 2 for 5 with three runs scored. Tamara Phillip of TYP finished 2 for 5, scored four times and drove in two. Tylia Nibbs-Henley had a 2 for 4 game with 3 RBIs. Sheniqua Fahie who was relieved by Chevaughn Richardson in the third, took the loss. TYP manager Allen Smith said his team started slow. The Men’s series resumed with Power Outage getting past the A’s 7-5, for a 2-0 series lead. Jeremy Penn was the winning pitcher and the loser was Neville Smith. Jamarlie James of Power Outage went 2 for 4 with a double and two runs scored. Sheldon John homered as part of his 2 for 4 night. He scored twice and had 2 runs batted in. A’s pitcher Smith was 2 for 4 with a run batted in.